Celebrated chef Barbara Lynch credits the defiant spirit of her upbringing in tough, poor 'Southie,' a neighborhood ruled by the notorious Whitey Bulger gang, with helping her bluff her way into her first professional cooking jobs; develop a distinct culinary style through instinct and sheer moxie; then dare to found an empire of restaurants ranging from a casual but elegant 'clam shack' to Boston's epitome of modern haute cuisine. One of seven children born to an overworked single mother, Lynch was raised in a housing project. She earned a daredevil reputation for boosting vehicles (even a city bus), petty theft, drinking and doing drugs, and narrowly escaping arrest-haunted all the while by a painful buried trauma. 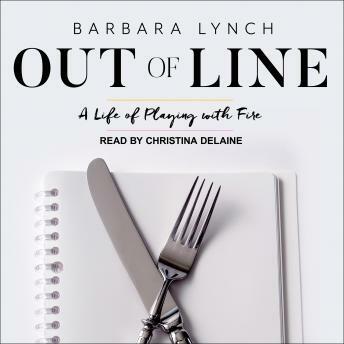 Out of Line describes Lynch's remarkable process of self-invention, including her encounters with colorful characters of the food world, and vividly evokes the magic of creation in the kitchen. It is also a love letter to South Boston and its vanishing culture, governed by Irish Catholic mothers and its own code of honor. Through her story, Lynch explores how the past-both what we strive to escape from and what we remain true to-can strengthen and expand who we are.